When it comes to cleaning the exterior of your home or building we are the ‘preferred choice render cleaning contractors’. We provide superior render cleaning services to both domestic and commercial customers. Covering the entire breadth of South Wales & South West of the United Kingdom. Our range of clientele includes local homeowners, private estates, property management companies and local authorities. With decades of experience in the cleaning industry, our customer satisfaction and great prices ensure the highest quality service. 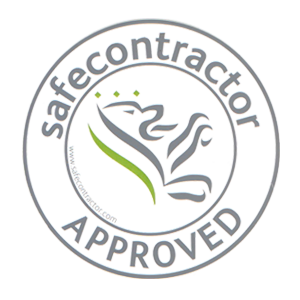 Safecontracor approved and adherence to the very latest health and safety guidelines you can be rest assured you’re in the right hands. The exterior walls of buildings are prone excess moss, algae, black spots and lichen. Over time render can also discolour if not regularly maintained. 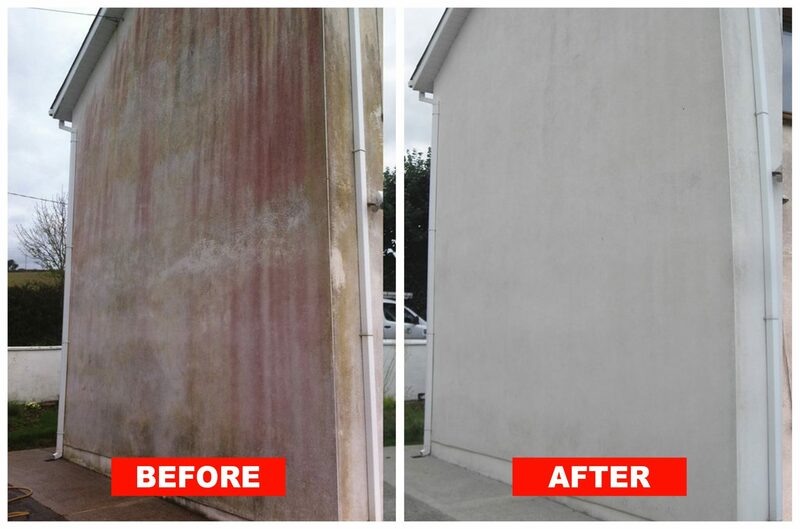 Using abrasive cleaning methods such as power washing on K-rend and coloured renders will actually damage cause lasting damage. For example, water at high pressure can penetrate into cracks, freeze in colder weather, expand and cause your render to blow. Extremely tough on dirt yet gentle on render and stone, softwashing is not just limited to render cleans. 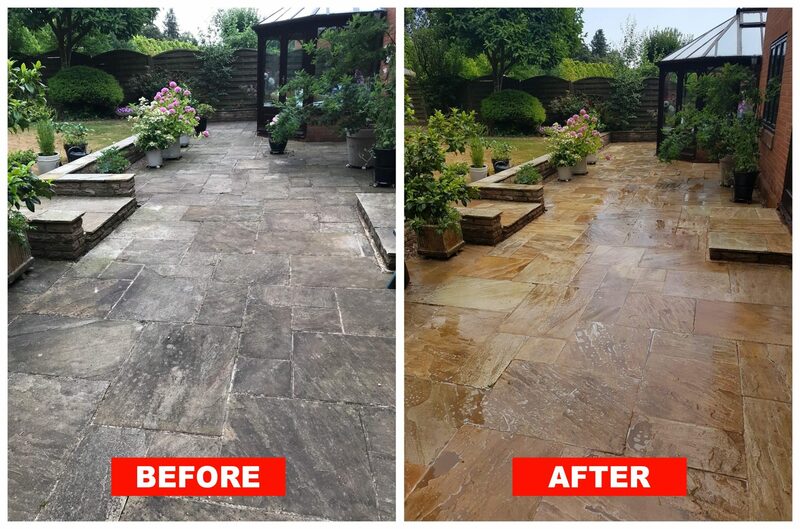 We use this cleaning method for patios, driveways, stonework, bath stone and much more. Soft washing is an alternative to the old-fashioned way of pressure cleaning exterior surfaces. It’s a gentle and effective technique that utilizes low pressure to spread over a mixture of cleaning solution and water to the siding, which gets rid of dirt buildup, moss, algae, and mildew. Over the years, soft washing has become a common and safer way to clean both commercial and residential properties without causing any damage to property while still achieving admirable results. How Does Soft Washing Work? Soft Washing is a technique that utilizes a controlled pressure washer to decrease the pressure of water output. This means that the pressure washer still uses more than a few gallons of water every minute, but at a decreased pressure (not more than 300 psi). Soft washing also employs the use of highly concentrated cleaning solutions or chemicals. Yes. Soft Washing is the safest cleaning technique available as of today. However, if you don’t use the system correctly you might cause some damage. High chemical concentrates damage some surfaces and kill plant life. Correctly used, it’s a safe method to clean. At Advance Render Cleaning, we use the latest in Soft washing equipment and all our employees are skilled in the safe use of cleaning solutions and best practices when using our equipment to clean your hard surfaces. Whats The Difference Between Pressure Washing and Soft Washing? Pressures washing and soft washing are both effective ways to clean your property’s exterior. However, they do that in different ways. Pressure washing utilizes highly pressurized water to forcefully get rid of stains and dirt from the surface that it comes into contact with. This is very effective, but it does pose any serious property damage risks. Soft washing forgoes much of the pressurization in favor of chemicals, which are not harmful to the environment. Our professionals know what nozzle extensions and combinations to use to achieve the right chemical mixture, volume and pressure to clean all surfaces safely and thoroughly. Alternative for pressure washing: Power washing creates erosion and strips away materials that may have been loosened by aging or decomposition. Treats infestations: Your property isn’t just grimy – it’s contaminated. Pressure washing only removes some of this biomass and doesn’t fix the root of the problem, leaving your surface vulnerable again. No damage from pressure: Inexperienced power washers can cause severe damage to a roof or other surfaces, especially if it’s old. Eco-friendly: In one hour of cleaning a pressure washer can use approximately 180 gallons to 480 gallons of water. On the flip side, soft washing only uses about 40 gallons of water. Soft washing is so effective that it lasts a lot longer than pressure washing. Making it more sustainable for the environment and your pocket. Looking for a price? Please enter your details below to receive a FREE quotation. 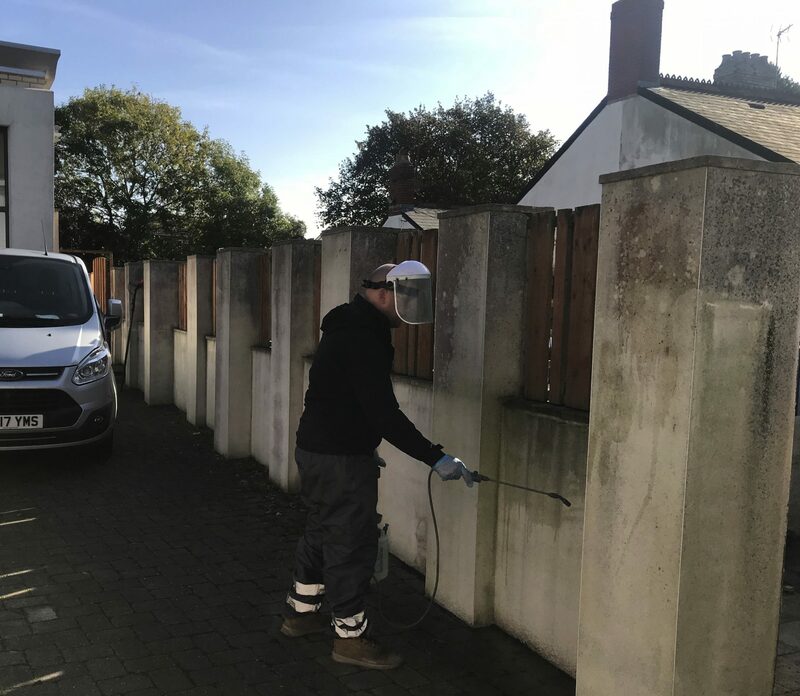 Our render cleaning services are tailored to best suit your needs and our wealth of knowledge helps us to provide only the best render cleaning services. Our approach to working safely is our priority and you can have complete confidence in our experienced professionals who will ensure the highest safety standards. BEST PRICES GUARANTEED: Simply put, we will not be beaten on price. The very best prices assured. HIGHLY ACCREDITED: We have made a huge investment in quality assurance accreditation, to make sure the job is done right. LATEST EQUIPMENT: The process we use utilizes a combination of specialist cleaning products and the latest low-pressure cleaning equipment. FULLY INSURED: Our teams are fully insured, and relevant safety and health standards are always adhered to. EXPERIENCED: All our cleaning technicians have been trained and fully experienced, with references from previous customers available upon your request.